The role of the sniper and what constitutes a sniper rifle are hotly debated topics. Many firearm enthusiasts define a sniper as a "one shot, one kill" perfectionist who must infiltrate the target area unnoticed, hit the target and then vanish into thin air. That certainly qualifies as a sniper, but we should not limit ourselves doctrinally by clinging to the belief that that is the only definition of a sniper. One of the most well-known snipers from World War II was Vasily Zaytsev. Zaytsev made a name for himself during the Battle of Stalingrad, where he crawled around the destroyed city for just over a month in late 1942 killing more than 200 German soldiersâ€”and did it all with a bolt-action Mosin-Nagant. Another well-known figure prominent in any sniper's landscape is Carlos Hathcock. The Gunnery Sergeant executed feats of almost incomprehensible skill. He crawled for four days and three nights to kill a Vietnamese general. He shot an enemy sniper through the tube of his scope moments before the enemy sniper would have killed him. Like Zaytsev, Gunnery Sergeant Hathcock did all of this with a bolt-action rifle. From these two impressive historical figures, many draw their doctrinal definition of what a sniper does, how he does it and what equipment he uses. While this methodology of sniping is still relevant today, the deliberate stalks, calculated movement and single killing shots represent only half of what today's sniper must face. Today's sniper must also perform on a more nebulous battlefield populated with urbanized insurgents. Insurgents are impossible to distinguish visually from innocent civilians, so a sniper often doesn't know what his target is until it's shooting at him. Gunfights are almost always fast and chaotic, so today's sniper must equip himself in a manner that enables him to appropriately deal with this type of threat. If you've ever attended any one of the U.S. Army's or Marine Corps' sniper schools, you've spent a considerable amount of time crawling on your belly. This is classic sniper tradecraft employed in rural environments. This is where we find our drag-bags, Ghillie suits, pruning shears, face paint and a number of other very manly accouterments. Sniping in a rural environment is why militaries of the world still cling to the bolt-action rifle as their primary sniping firearm. This is the only environment in which such a weapon system makes sense. If not kept in check, militaries will develop their sniping rifles solely around this sniping role and our bolt-action rifles get heavier and heavier. If you look at the bolt-action sniping rifles from Vietnam (where we did some serious shooting), you'll notice that they bear much more resemblance to a hunting rifle than to the monstrous M40A3 that the Marine Corps hoists onto today's Devil Dog. Some would argue that the M40 has evolved. Evolution shouldn't mean that you now have to hump around a rifle that's twice as heavy as the original, sports a monstrous prone stock that seriously inhibits positional shooting and still doesn't offer you any more compatibility with night vision equipment or infrared lasers than the rifle your dad toted around Vietnam. Is that evolution? When we enter the world of military sniping in an urban environment, the bolt-action rifle becomes a huge liability and the short-barreled semiautomatic sniper rifle really shines. Sniping is much more than lying behind the rifle and pulling the trigger, especially in urbanized terrain. Snipers cannot miracle themselves into their firing points and must be able to move securely from their infiltration platform to the firing point, a repetitive process that can occur several times over several days and often requires some running and gunning along the way. A sniper team on the move in an urban setting still consists of a sniper and a spotter. The problem created when the sniper carries a bolt-action rifle is that he cannot effectively clear corners, stairwells or rooms and so places his M4-armed spotter in greater danger. Remember, at a minimum it takes two appropriately equipped men to enter and clear a room, and a bolt-action rifle isn't appropriate for this task. If the sniper were carrying, say, a 16-inch-barreled semiautomatic 7.62mm, he could effectively do everything his spotter could do with the M4 and still be exceptionally well equipped for any sniping task placed before him. I can hear the cries of "Blasphemy!" already. Surely, no serious sniper would ever be caught dead with a 16-inch barrel on his rifle. Some would falsely argue that the shorter barrel would be less accurate. That is absolutely incorrect. The only disadvantage associated with a shorter barrel is a loss in muzzle velocity. The downside of a lower muzzle velocity is that it can create weaker terminal ballistics and has a more parabolic flight path for the projectile. If we were talking about the 5.56mm round, I'd lend some serious credence to the short barrel/weaker terminal ballistics argument. However, given the 168- to 175-grain mass of the 7.62mm projectile, I think that even 1,000 fps would prove to be lethal. Even with a 16-inch barrel, the military load for 7.62mm will still retain 1,000 fps out to 800 to 900 yards. The increasingly parabolic flight of the round that comes with lower muzzle velocities used to mean that the sniper would have to spend more time building an accurate data book. There would have been more elevation variation as the distance to the target changed, requiring more data points for an accurate book. However, with the advent of the Horus reticle, handheld ballistic computers and now the Whiz Wheel, there is no longer the need for a sniper to build a data book. These tools enable the sniper to true his rifle to computer algorithms and know within 1/100 of a mil where to hold to hit the target. Yes, this is really possible. Fact is, semiautomatic is better than bolt-action when militaries are sniping with the 7.62x51mm cartridge. The 7.62 NATO, in military dress, pushes a 175-grain bullet at about 2,675 fps out of the M24 and M40A3. Shorten the barrel to 16 inches like the LaRue OBR does and the velocity drops to around 2,550 fps. This is not a substantial loss. What the LaRue OBR allows that a bolt-action rifle doesn't is that the sniper can effectively fight like a rifleman until he needs to start sniping. Entering and clearing buildings, running up stairwells and engaging multiple targets are now well within his capabilities. Good luck doing all of that with a bolt action. Please don't think I'm a bolt-action hater. I have a gang of bolt-action rifles, and I love them all. Bolt-action rifles are great because they're simple to manipulate, can digest a wider range of bullet weights and velocities, and offer the shooter more control of when the round enters the chamber. They are an excellent choice for law enforcement sniping. While I loathe a 16-plus-pound bolt-action 7.62mm sniper rifle, I think a 16-pound (or lighter) bolt-action .338 Lapua Magnum makes wonderful sense for a sniper rifle. Or, if you build a nine- to 10-pound 20-inch-barreled .308 Win. as a sniper rifle and put a hunting stock on it, I think that's OK, too. While it's all well and good for us gun hacks to sit around pontificating about the future of sniping, perhaps some empirical evidence is in order. It just so happens that the U.S. Army hosts a sniping competition that lasts several days and involves competitors from all branches of service, the law enforcement community and even allied countries. Competitors are allowed to enter in two categories, Service Class and Open Class. The Service Class is for teams where both members fire rifles chambered in 7.62x51mm. The Open Class is for competitors firing anything they want. The 2010 International Sniper Competition and the winning rifles provide us with some insight into what today's most talented snipers carry and shoot when they have a choice. The winners of the Service Class were SFC Chance Giannelli and SFC Ed Hoymeyer. Both men won with the LaRue OBR. Chance's gun had a 16-inch barrel, and Ed's had a 20-inch barrel. A USASOC headquarters team won the Open Class, and the spotter of that team also carried a LaRue OBR. Three out of the four winning rifles were LaRue OBRs. This is what we sometimes refer to as a "clue." It seems the semiauto sniper rifle has quite a following. 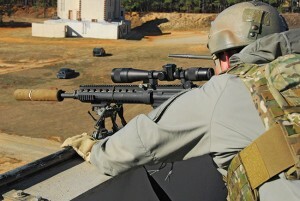 Around the time I was writing this article, the Army's Special Operations Command hosted its own sniper match at Fort Bragg run by the good men of the Special Forces Sniper School. I hot-footed it down to Bragg to catch up with some old friends and teammates and look in on the match. While I was there I also had the opportunity to interview SFCs Giannelli and Hoymeyer. One of the first questions I asked both men was why they chose to compete in the International match with the OBR. Chance responded, "My OBR consistently shoots half MOA. It's fast to get back on target, and recoil management is a nonissue." Ed said, "My 20-inch OBR shoots 21/2-inch groups at 500 yards. It's light, offers fast follow-up shots and doesn't require me to break position shot to shot. It's easy to use for positional shooting." When I asked Chance if he ever felt outgunned, he said, "The .338 Norma [used by the USASOC headquarters team] was a little intimidating. However, we felt our most serious competitors were Chris and Kevin [fellow Special Forces Sniper Instructors], but they were shooting a different class." Ed's response bordered on cocky. "No. Even with the Open Class guys." Knowing that some will poo-poo a semiauto sniper rifle because they claim it's not reliable, I asked both Chance and Ed if they'd ever seen or experienced a malfunction with their OBRs. Both men responded "No." Considering the amount of ammunition they've seen put through the platform, I think we can confidently say that a semiauto like the OBR is completely and totally reliable. The USASOC Sniper Competition provided more evidence of what we saw at the International Sniper Competition. Once again, both members of the winning team were carrying semiauto 7.62mm guns. The match required stalking, shooting unknown distance, movers and a final running and gunning stress event. Semiauto sniper rifles such as the LaRue OBR are the choice of today's discriminating professional. 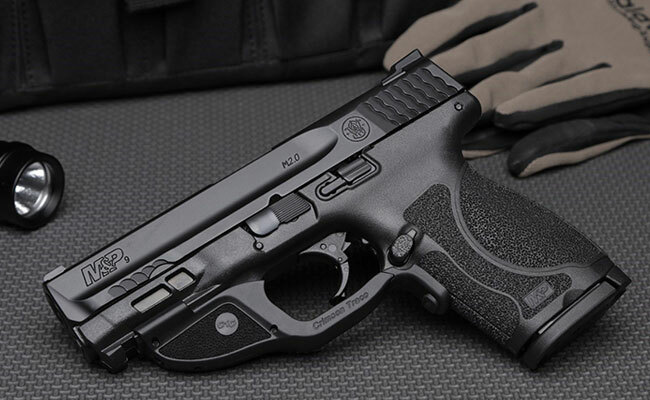 Men who go into harm's way like the gun because of its accuracy, utter reliability and flexibility of the platform. 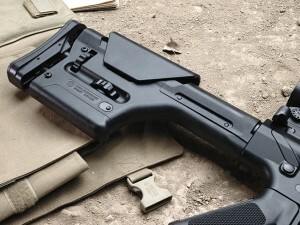 Integrating the latest lasers, thermals and night vision equipment is a breeze, the rifle lends itself well to positional shooting, and the semiauto action greatly facilitates recoil management. From a sniper's perspective, this is a "do anything" rifle. While I still see a place on the battlefield for bolt-action rifles, they are more relevant when chambered in cartridges such as the .300 Win. Mag. 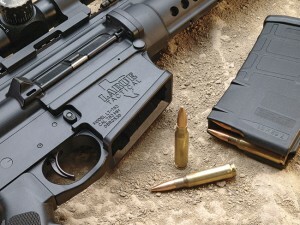 or .338 Lapua Mag. and employed at ranges beyond 800 meters. For everything closer than 800 in either urban or rural settings, the choice is clear. If you're serious about sniping, shoot the OBR.